Note: DigCCurr I ran from 2006-09, and is now complete. See final report for results and recommendations. Our cultural heritage, modern scientific knowledge, and everyday commerce and government depend upon the preservation of reliable and authentic electronic records and digital objects. While digital data holds the promise of ubiquitous access, the inherent fragility and evanescence of media and files, the rapid obsolescence of software and hardware, the need for well-constructed file systems and metadata, and the intricacies of intellectual property rights place all of these materials at risk and offer little hope of longevity for information that is not intentionally preserved. A decade of work in digital preservation and access has resulted in an emerging and complex life-cycle constellation of strategies, technological approaches, and activities now termed "digital curation," but little in the way of new education to prepare the first generation of digital curators to work in trusted digital repositories. To date, most education and training opportunities focusing on digital preservation and, more recently, curation issues, topics, and technologies have only come in the form of one- to five-day workshops. This three-year, collaborative project seeks to develop an openly accessible, graduate-level curricular framework, course modules, and experiential and enrichment components and exemplars necessary to prepare students to work in the 21st century environment of trusted digital and data repositories. Photo credit: Songphan Choemprayong (totomaru), all rights reserved. To accomplish these tasks, this project brings together key international figures in digital preservation from the United States, Canada, the United Kingdom, the Netherlands, Italy, and New Zealand, to serve on an Advisory Board. 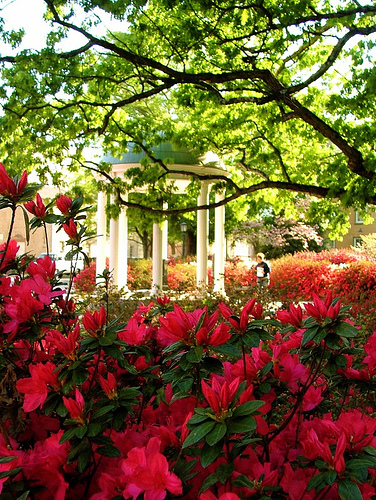 Repositories at UNC-CH will provide IMLS-funded Carolina Digital Curation Fellows hands-on application of the principles taught as they manage a wide range of digital objects, including public records, cultural heritage assets, teaching materials, and research data. These Fellowships will serve to integrate the curriculum and the experiential components, advertise the existence of the programs at SILS, and draw attention to the need for digital curation. Two symposia (DigCCurr2007 and DigCCurr2009) bring the issues of digital curation and this curriculum to the broader library, archives, and museum communities as well as the public. Sustainability and updating of the educational products will be ensured through programmatic adoption at UNC-CH and widespread dissemination and use at other educational institutions. 1. Build a growing and evolving network of international experts, both educators and practitioners, in the digital curation arena to foster outstanding curation education opportunities worldwide. Our Advisory Board will work closely with and assemble twice during the development and pilot implementation of the curriculum. 2. Raise public awareness of the need for and nature of digital curation through two public symposia linked to Advisory Board meetings. Video of these events will be mounted on the project website for worldwide access. 3. Create and maintain a curriculum, field experience exemplars, and enriching activities that will provide state-of-the-art preparation for students in the areas of digital curation. 4. Fulfill emerging needs in the information professions by preparing graduates to design, build, populate, and manage trusted digital asset repositories. 5. Attract the best possible students to this emerging area of study through the use of IMLS-funded Carolina Digital Curation Fellowships that will support class and experiential learning. 6. Attract a diverse student population through widespread advertisement of the program and fellowship support. 7. Prepare students to take active roles in research in digital curation. Registration is now open for the 2012 Summer DigCCurr Institute, May 21-25, 2012.